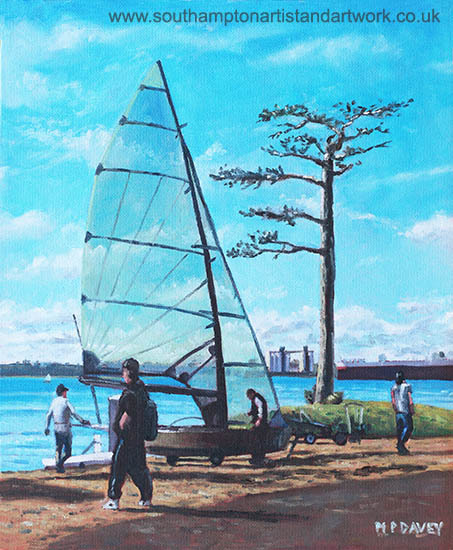 This oil painting shows a sunny winters morning at a location along Weston Shore in Hampshire. A sailing boat is being prepared with a number of others for a sail on Southampton Water. The transparent sail makes a nice image with the blue sky showing through. The old beaten up tree is a local landmark. On the opposite side of the water can be seen a large cargo ship docked at the silos at Southampton Docks. The painting, measuring 10” x 12” is painted in the 'wet in wet' technique.